Sometimes the problems society faces are enough to make you want to hide under the bed, and on closer inspection it seems that at every turn seemingly sensible solutions are blocked by those pesky vested interests and the powers that be. This is why initiatives like the Brixton Pound, what Davina Cooper (2014) calls ‘everyday utopian communities’, provide hope that through imagination and collective action communities can live life in radically different ways. Joe and I were interested in the ‘tax gap’, a £122bn black hole in the country’s finances by the non-payment of tax (Tax Research UK 2012). The tax system is complicated, opaque, defended by highly-paid accountants. The unpaid billions seem to benefit the richest, and penalise everyday tax payers. We wonder if it possible to move things in a fairer direction. What could we do? 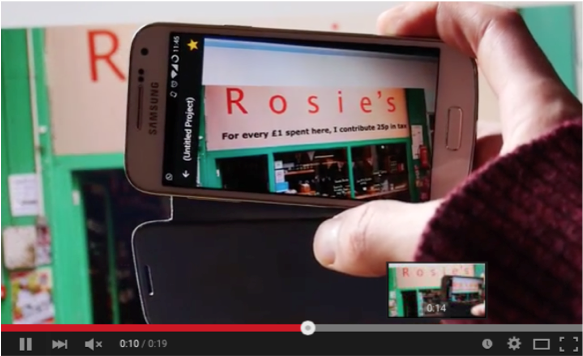 A question that soon changed to what would the B£ do? 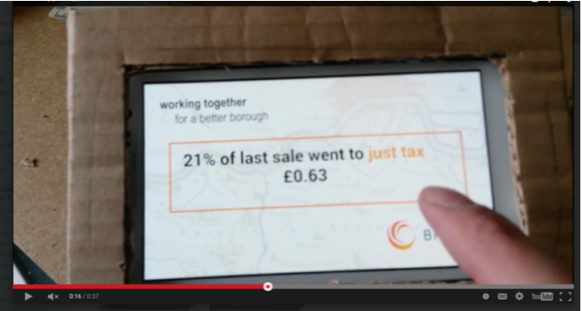 Could the Brixton Pound develop a tax system that could work better for the community? We thought there was something in the way that tax is hidden and unspoken, and that by making tax visible and ‘audible’ in communities that would make companies more likely to pay tax, increase transparency, and help close the tax gap. To enable us to explore these ideas and develop practical approaches we decided to use design fiction methods with the B£ community. Design fictions are part science-fiction, science-fact, and part designed visions of the near future. The process involves imagining where current trends and technologies might take us in the future, developing products and services, and then wrapping these ideas up in believable stories, so that more meaningful conversations can be had. 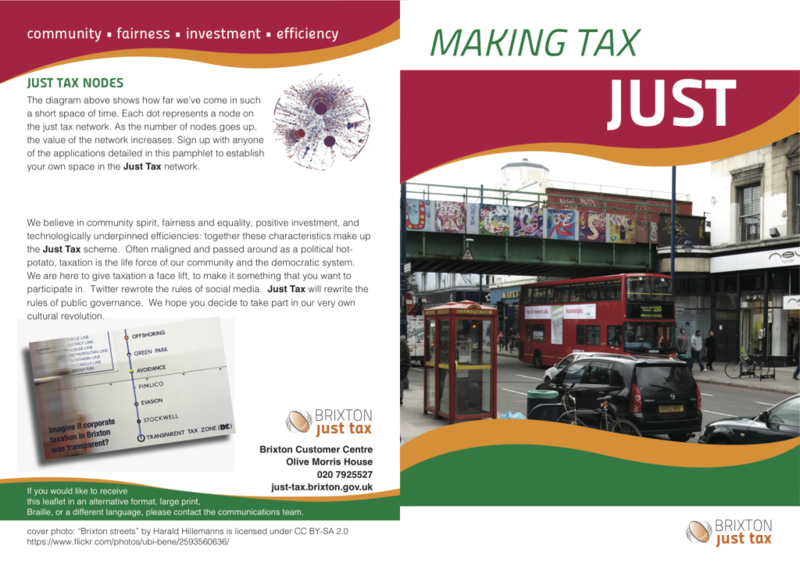 So we worked we hosted a series of workshops to discuss tax with people from Brixton, made a ‘story world’ where there was a new ‘Just Tax’ scheme in Brixton. 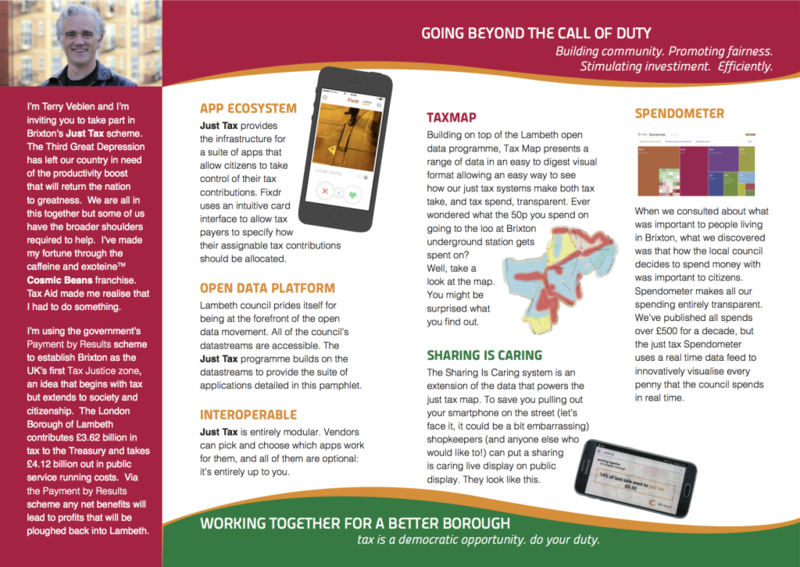 We produced a series of prototypes, promotional materials, and with the help of some friendly Brixtonites we filmed a ‘speculative documentary’ about the scheme set in the year 2017. The most interesting conversations we had were not about how to make tax visible in communities, but rather how to encourage people in communities to consider different types of relationship, different types of mutual obligations between citizens, and within that reciprocal commitment, alternative configurations of tax collection and expenditure. In the discussions the crucial dimension seemed to be whether design fiction can engender the desire for a better way of being or living and then how to stimulate the collective engagement to make the world otherwise (Levitas 2013). We’d like to thank all those that took part in the research, the people that attended the workshops and Tom Shakhli for helping organise the events.